ReportServerException: The report server has encountered a configuration error. Logon failed for the unattended execution account. ERROR: Throwing Microsoft.ReportingServices.Diagnostics.Utilities.LogonFailedException: Logon attempt for user ‘username’ failed. Okay, so by now you are probably wondering how to fix this. It’s quite simple actually. 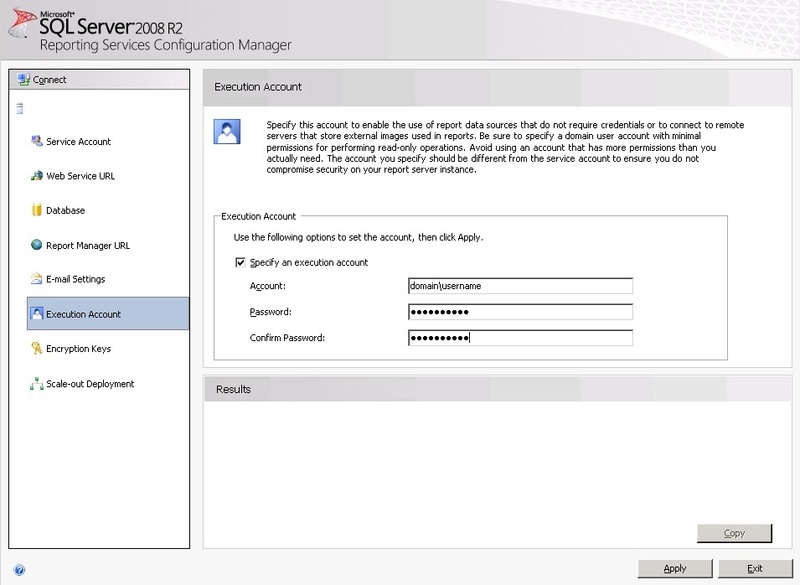 On your SQL Server, load up the Reporting Services Configuration Manager. Connect to the Reporting Service that is having the problem and then click on the Execution Account tab on the left. Specify a known working user account (local or domain) and click Apply. Your Reporting Services should now be working once again!